‘I know this place that has great Vietnamese food. Ignore the name, just order off of the Vietnamese menu.’ So said one of our sources for all things Asian in Columbus. Who were we to argue? 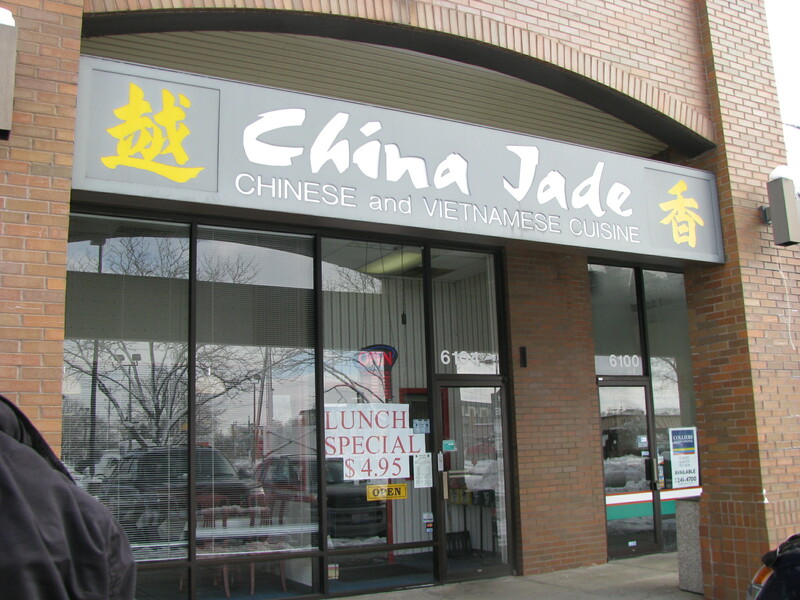 China Jade’s space is unremarkable and clean. Service was friendly and more than willing to work around the language barrier. After flipping through the massive ‘Chinese’ section of the menu (written entirely in English), we found the ‘Vietnamese and Chinese’ offering (written in Chinese, Vietnamese, and English) and dove in. From the apps we ordered pork skin spring rolls, jelly fish, and mandarin duck. Pork skin spring rolls – hmmm. To the best of our ability to discern, the ‘pork skin’ component was a dry, dusty and largely flavorless powder. The remainder of the roll was as expected, but the pork dust seemed to dampen enthusiasm for all who tried it. The jellyfish, on the other hand, was a hit. Presented as a salad, the thin strands of jellyfish were a slightly chewy counterpoint to the carrots and cabbage that accompanied. All were an excellent conveyence for the dressing – a sweet and salty mix laced with sesame. The duck was the most controversial of the trio. It was crudely chopped (bone-in) and served in a somewhat sweet brown sauce. The flesh was neither exceedingly tender nor tough. I enjoyed it, but opinions certainly varied. Generous in quantity, it seemed a good value at $7, but there was some understandable grousing about the effort involved in separating the flesh from bone and gristle. From the ‘meal in a bowl’ section we ordered bun cha gio thit nuong (egg roll w/rice vermicelli and grilled pork), and from the ‘rice platter’ section we ordered com suon nuong (grilled pork chops). No complaints on the bun cha – nice crunchy egg rolls, tender well seasoned pork, the usual rice noodles, all topped with scallions and chopped peanuts. Nice. The com suon nuong was an even more of a crowd pleaser – its sweet, crunchy, coriander spiked crust (deep fried?) gave way to succulent pork chop goodness. A Malaysian foodie friend (and co-conspirator) of ours dropped this bit of wisdom on us: first-generation Asian restauranteurs in the US often come from a street vendor background in which they were expert at preparing a very small selection of dishes at a very high level in their country of origin. They generally feel compelled to offer a much wider variety of options in the US, but it is usually the dishes they perfected in their days as a street vendor that really shine. This might just explain the veritable mantra we’ve heard from quite a few other Asian friends of ours – don’t seek the right restaurant, seek the right dish from the restaurant. This relates to China Jade in the sense that we had some items we loved and some we weren’t so crazy about… and given the above theory, that’s probably as it should be. We suspect that there still might be a gem or two here we haven’t uncovered yet, so stay tuned. This entry was posted in Asian, Restaurant, Vietnamese and tagged jellyfish, vietnam, Vietnamese. Bookmark the permalink. I loved the jellyfish salad, it was really light and refreshing. I was expecting the jellyfish to be really slimy, but it was more chewy than slimy.